Telangana State Government has released GROUP-2 Notification Under TSPSC- Telangana Public Service Commission, TSPSC Announced GROUP -2 Recruitment Notification 2016 to full fill the 439 vacancies under Group -2 within Telangana state, through written test and Interview, TSPSC is going to full fill the vacancies Under GROUP -2 is Municipal Commissioner Grade -3, Assistant Commercial Tax Officer , Sub Register Grade-2, Extensional Officer Rural development and Sub Inspector -Excise posts. 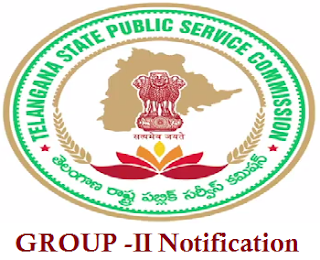 The official TSPSC GROUP -2 Notification will be available on the Telangana State Public Service Commission Official Website www.tspsc.gov.in TSPSC Chairman Mr. Ghanta Chakrapani Announced GROUP-2 notification on Wednesday. TSPSC inviting the ONLINE application form from the interested and qualified persons to full fill the Municipal Commissioner Grade -3, Assistant Commercial Tax Officer, Sub Register Grade-2, Extensional Officer Rural development and Sub Inspector -Excise posts. Online applications starts from today onwards 31-12-2015, and people can apply Group-2 posts up to 9th Feb 2016, candidate have to aware before applying the Group -2 posts candidates should Register in (ONE TIME REGISRATION), if already register no need to register again. And GROUP -2 Exam will be Conducted on APRIL Last Week 2016, EXAM date not yet confirmed. Most probably exam will be conducted on April 24th and 25th , every day 2 papers, Morning and Afternoon, TSPSC GROUP-2 exam will be finished in 2 days, after written test candidate have to face personal Interview.